THE PLAYFUL WALRUS BLOG: Where's the Civility for Dr. Laura? 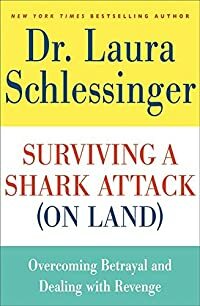 Born out of her own highly public encounter with betrayal and its emotional aftermath, Surviving a Shark Attack (On Land): Overcoming Betrayal and Dealing with Revenge is one of Dr. Laura Schlessinger's most personal books. As Dr. Laura's legion of fans know and appreciate, the radio host, nationally syndicated newspaper columnist, and perennial New York Times bestselling author never skirts controversy, and here she offers an incisive and unsurprisingly plain-speaking look at the hot-button topic of how to deal with the traitorous, backstabbing "sharks" we confront in our personal and professional lives. "Every single human being on the face of the earth has been betrayed, backstabbed, undermined, screwed over, or had their reputation attacked at least once in their lives," Dr. Laura writes. "It's a horrible experience, leaving you stunned, seared, sad, and very, very angry." When subject to a stealth land shark attack, the first reaction is shock and disbelief. When attempts to shut down the betrayal fail, the typical next response is to strike back. Often, that action only makes things worse. So, what is the source of betrayal and how do you survive it? How do you keep other peoples destructiveness from destroying you? Can betrayals be blessings in disguise? "Betrayals can teach you-if you're listening-to allow people their faults and strengths and to use your own judgment to determine where to place each individual in your solar system," says Dr. Laura. Trusting everyone is foolish and leaves you open to becoming a victim, she adds, but "maturity gives you perspective and the security to make assessments necessary to protect yourself and get the best results when dealing with people. People are unpredictable, not transparent. It is important that you internalize your experiences so that you can use them as a basis of judgment." The culmination of more than thirty years talking to radio callers about feelings of betrayal and revenge, Surviving a Shark Attack (On Land) is vintage Dr. Laura: astute, opinionated, uncompromising, and applicable to all our lives.